The number of xpats living here is growing every year though all these people need to pay a local agent to renew their Visa every 30 days. And I would not say that people generally fall in love with Ubud simply because it is THE PLACE from Eat, Pray, Love. No, the town and its surroundings really do have the magic that entangles you within hours. When I reached Ubud (after a three-hour slow drive on a shuttle bus from Amed with a transfer in Patangbai) I thought: this place is crazy! Truly, there IS a lot of traffic. Especially on the main – Hanoman – street. The town is busy and you never get away with taxi drivers offering their service. You can rent a bike (like I did) to cycle around the town (though – trust me on that one – you have to be an adrenalin-sport lover to do so amongst all those cars and motorbikes and pedestrians), but to go to the places out of town you need to rent a motorbike – or hire a taxi driver. Upon arrival to Ubud I made myself properly messy in the rented room in one of those typical temple-like looking Ubud centre complexes. I like to throw all my things on the bed when I get in… I do that not only on holidays, but also at home, when I get back from work. I just like the messy moment before I clean up and tidy up because generally I like my surroundings neat, one would say: spick and span. I spent a few minutes exploring the room – that taste of getting acquainted with your new home – and found a glass statue of a phallus in the wardrobe – a unique gift I dare say! I mean, people find forgotten coins or cosmetics in their hotel rooms, but THIS!? I had a good laugh after the first shock and then wondered what the Universe was telling me by that. I could not come up with anything else but: They just want me to have fun! And with that resolution I went into the streets of the town, riding around on a rented bicycle! 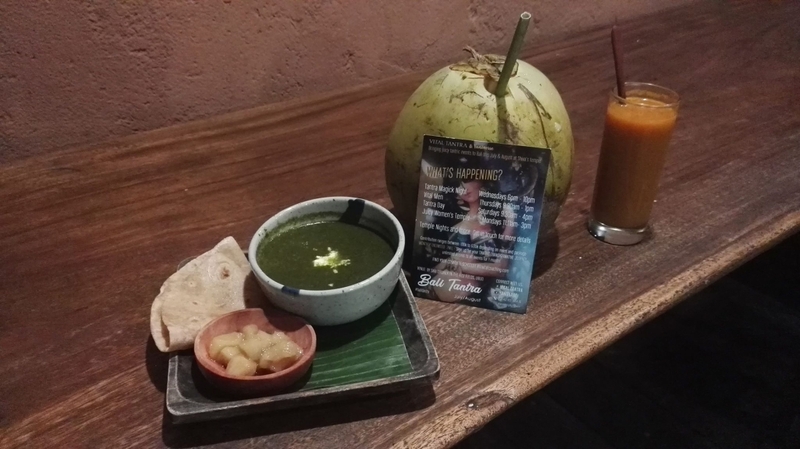 Forget about Julia Roberts in the calm version of Ubud in THAT movie, it is NONSENSE! This place IS crazy when it comes to traffic… but, truly, after a while I realized I was more excited by all that traffic and slalom riding rather than worried… I was not afraid. I was hyped on adrenalin! Especially when I took that old bike into the Ubud market packed streets. I thought I would just CYCLE THROUGH the marker, LOOKING. The result of which was eventually a new yoga mat cover, a silk and satin dress, silver earrings, a herbal hand cream, a face cream and a cough syrup (which came without a package leaflet but said on the cover in Warning and Precautions: “There have been reports of severe skin reactions such as…”- and they named them out in eight lines to continue! You just WANT TO USE THAT thing!). As for that cough, it was simply caused by air conditioning in a car where I was sitting for like 15 mins all wet after the boat ride from Gilis (cause I decided to sit on the outside deck part where there is normally just the staff operating the boat). The market offers a lot of clothes and gifts and local products. You need to haggle and if you do it well you can get down to 50% of the price, but more likely you are happy to end up on 60%. If you want to buy something in a shop though, they will only give you a discount of 10%. Sometimes you might get down by 15% but it is rare. The policy in shops (those where they accepted credit cards) is simply different. And you might need to pay 3% for using the card. The next day, I began my morning early in order to get my chance to meditate in the Saraswati temple which is normally closed for public. Funny enough, the main gates are closed at all times, but if you are nice and truly want to pray or meditate in the temple and you talk with the management of Pura Saraswati Bungalows located just next door to the main entrance to the temple (yes, the one with the huge restaurant) you might be lucky enough to be allowed to use the side entrance (which is open from 7:00 till cca noon; most tourists residing in the resort don’t have the slightest idea what that entrance is for). Next on the programme was the Monkey forest, a renowned monkey sanctuary where I met the amazing French mosaic artist Rémy with his ten-year old daughter Nil and we had a fun spontaneous time discovering the place which truly is like a jungle with small waterfalls and streams and hundreds of monkeys that are cuddly and cool but can become very aggressive when they see food in your hand (needless to say you are not supposed to feed the monkeys…). For lunch, I went up the road where my homestay was located (a street called Jalan Sukma), where they have the best Nasi campur that I have tasted so far on the island, with a piece of jackfruit too, a variety of meats and amazing sauces. In fact, I took all my lunches up that place (for the price of 25.000 RP) and all my dinners in the Yoga Bar (after the evening classes). Nasi campur (meaning literally “mixed rice”) refers to a dish of a scoop of nasi putih (white rice) accompanied by small portions of a number of other dishes, which include meats, vegetables, peanuts, eggs, and even a fried-shrimp krupuk. Depending on the vendor the dishes vary. 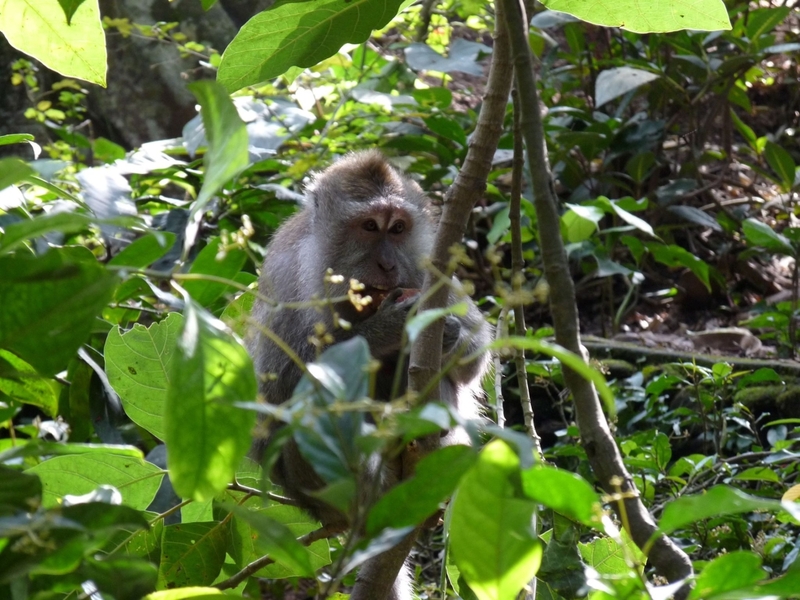 The meal is popular in Southeast Asia, especially in Indonesia, Malaysia, Singapore, Brunei, and southern Thailand, and also the Netherlands through its colonial ties with Indonesia. Except for the regular yoga classes, on Friday and Sunday evenings you can join the ecstatic dance classes, which, as the local receptionist would say, are like discotheque, but you dance alone with no alcohol to different style of music. These are usually so packed that there waiting lists! I will never forget this Yang and Yin class by Paul, a handsome guy with the perfect American smile. The first part of the 90-min class felt more like preparation for martial arts while the second part was a yin yoga class (but only about three asanas were practised, each held for about 10 mins). I was very disappointed with the first part of the class and there were people leaving… I wanted to leave too, also because the music was rather loud while the teacher – walking around and jumping around the rather big open bamboo shala – had no microphone, so it was impossible to hear most of his talk. There were mosquitos biting and the yoga mats smelled really badly! I tried three until I understood that it was not going to get any better and that I should have brought my own one. Anyway, having paid that high price of 130.000 RP I decided to stay till the end. So I got the interesting ending of Shavasana in the darkened shala with the repro music turned off and with Paul sitting in the middle of the room with his guitar playing unplugged a very nice melody. It is his habit to do so and it does bring him a lot of fans… (as if his looks were not enough). Anyway… as for the surroundings of Ubud, you surely need to get a motorbike unless you are a very good cyclist. The famous Tegallalang rice field is overcrowded, with tourists running everywhere, destroying the edges of the terraces, with kids selling postcards and with all the photo places that just ARE so annoying because they do locate them at the best views and you have to pay to get a picture there which eventually looks cheesy with all the decorations the locals prepare. 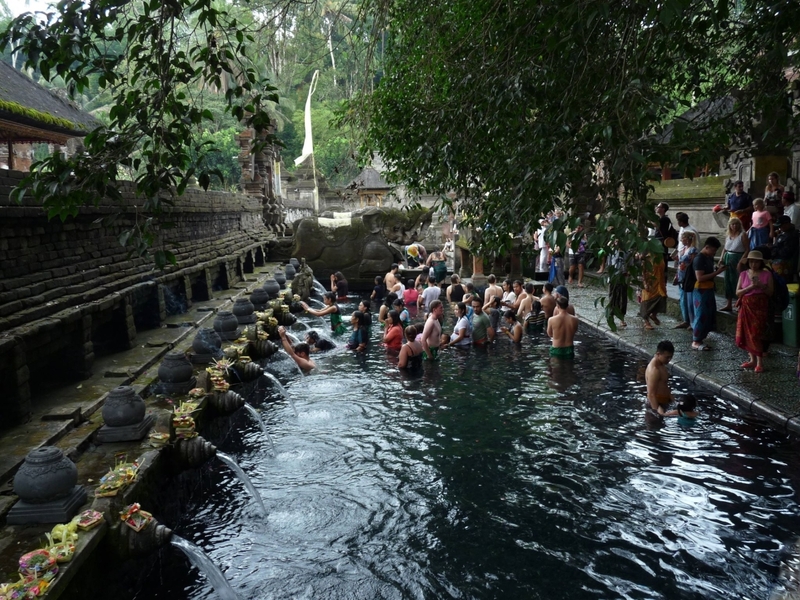 Tirta Empul, the holy water temple, is surely something that stays on your mind, even if you decide not to do the ritual bath. 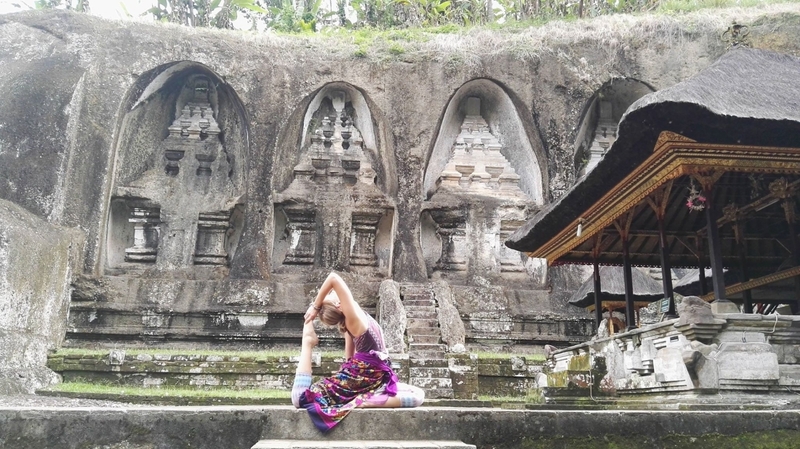 I came to Bali, the island where people often go to find themselves, without looking for anything… yet, I keep finding… and one of my great spiritual experiences arrived in this temple. 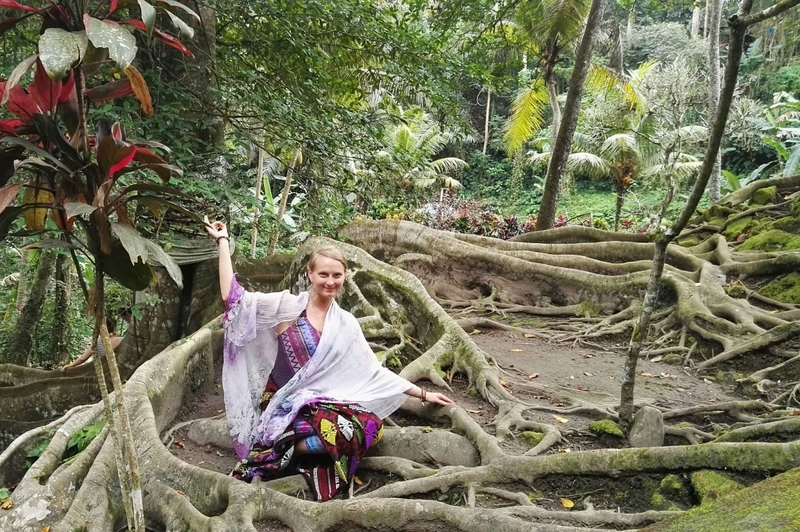 My connection with the water in Tirta Empul is something that deeply permeated every single cell of my body and every essence of my soul. 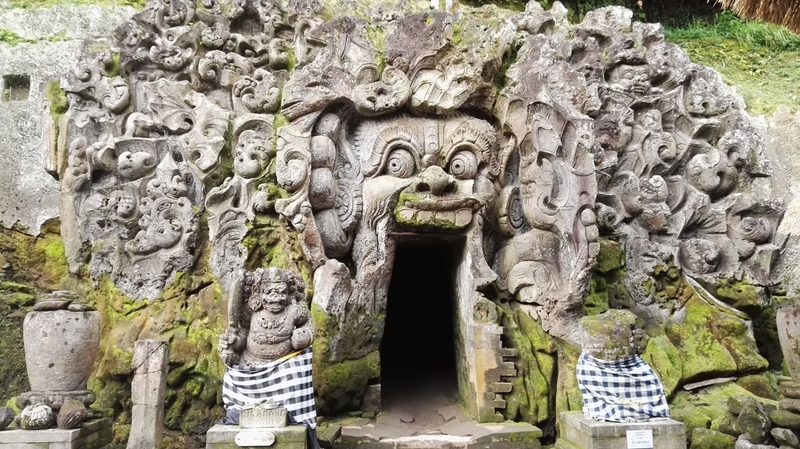 That place does have a very special atmosphere, as well as Goa Gajah, The Elephant Cave, which can also get crowded but with the massive trees and waterfalls below it offers certain tranquillity and serenity. 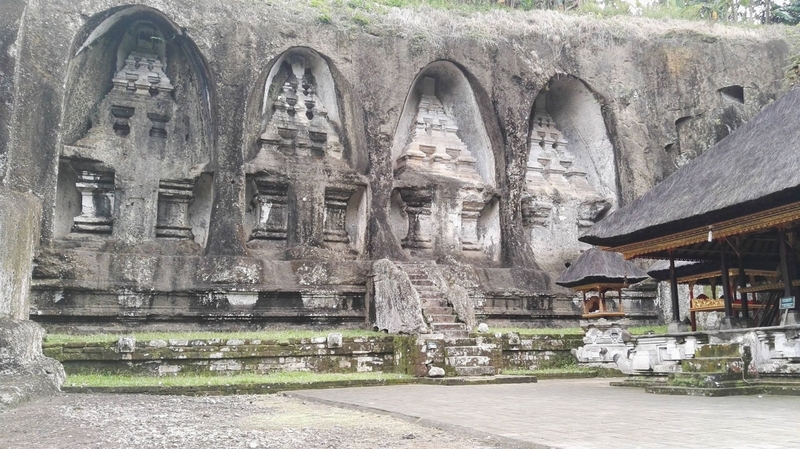 My favourite was Ganung Kawi rock temple complex centred around royal tombs carved into stone cliffs in the 11th century. With the huge 300 steps to climb it was quite a warm-up to get there but totally worth the view over scenic rice terraces and the bath in the river. Plus, this place seemed rather off the beaten tourist track… may it remain so. Leaving Ubudu one early morning to get the 7 a.m. shuttle bus I realized that the place really did get into my heart, with all its business, smog and humidity which makes it impossible for your wet clothes to dry (and which thus tend to smell badly sooner or later). To me, it felt like a small Hanoi which I still cherish in my memories, but with more temples and Hindu touch.